Authorities said Wednesday they have issued 57 arrest warrants in Florida and five other states. Attorney General Pam Bondi says charges will include racketeering, conspiracy, money laundering and possession of slot machines. During a press conference Bondi called Allied Veterans of the World's description of their operation as a charity "shameful," noting that less than two-percent of $300 million in profits went toward helping Veterans. Authorities say they group spent millions on lobbyists and political donations, which they are now looking into. Update 10:45 a.m.: Florida Lt. Gov. 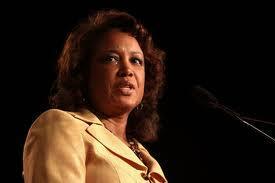 Jennifer Carroll has resigned amidst a criminal investigation involving her consulting firm. As the Florida Times-Union first reported, Carroll’s firm did work for internet café operator Allied Veterans of the World. Its owners were recently arrested on racketeering charges. Susan MacManus, a political expert at the University of South Florida, said, Carroll’s resignation could hurt Gov. Rick Scott and his chances of reelection. "I think with the lieutenant governor, as is true with vice presidents, it is not helpful when your No. 2 in command, who’s been selected by you, has problems that result in resignation," she said. Carroll submitted a brief resignation letter Tuesday morning, saying simply, "It has been an honor to have served the state of Florida in this capacity." She has not been charged with any crime. Florida Gov. Rick Scott has not yet commented on the resignation. He’s expected to address the media this afternoon. 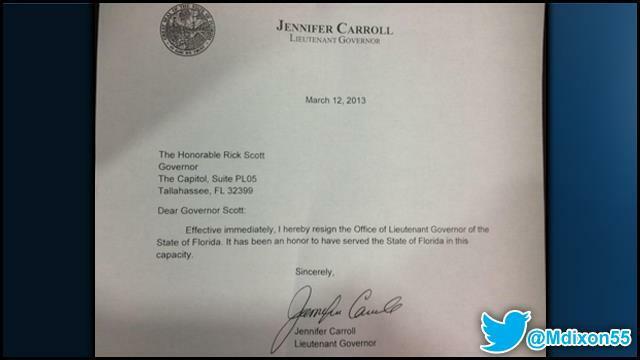 Carroll's resignation letter was originally posted by Florida Times-Union reporter Matt Dixon. TALLAHASSEE (AP) - Florida Lt. Gov. Jennifer Carroll has resigned amid fallout from an investigation into internet cafes that are fronts for gambling. Officials from that non-profit internet cafe company were recently arrested on racketeering charges. The owner was arrested Tuesday in connection to allegations that he made $290 million after supplying illegal gambling software in Florida and claiming the games' proceeds would benefit a veterans group. Authorities also interviewed Carroll. You can read the 130 page search warrant here. Check back later on for more updates.